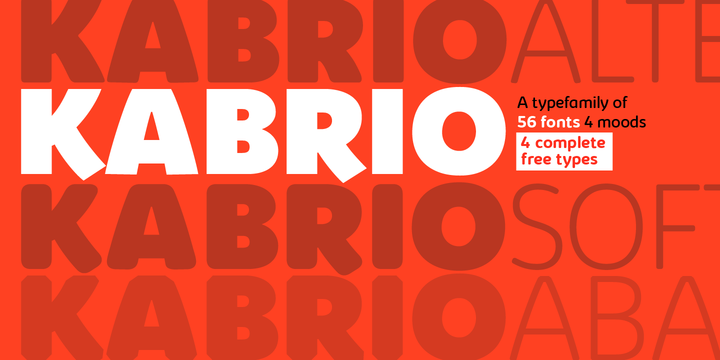 Kabrio is a contemporary sans serif typeface created by Cosimo Lorenzo Pancini together with Andrea Tartarelli and published by Zetafonts which comes in 56 styles, a family with four (Normal, Alternate, Soft & Abarth) stylish moods. This four moods has different corner tratments and each has 7 weights (from XLight to Heavy) and italics. It is available useful OpenType features and language support. It can be use for typographic purpose. Also is suitable for branding, headline, logo, magazine, packaging, print etc. Have fun! Styles: Normal, Alternate, Soft, Abarth, XLight, Light, Book, Regular, Bold, XBold, Heavy, Italics. Price: starting from $15,00 for one font to $190,00 for all 56 fonts. A font description published on Monday, February 5th, 2018 in Andrea Tartarelli, Cosimo Lorenzo Pancini, Fonts, Zetafonts by Alexandra that has 1,782 views.